While California refocuses its 21st Century transportation investments on equity, environment, and a state of good repair, the City of Bakersfield and Caltrans has continued down a failed 1950s path toward social, economic, and environmental ruin. Caltrans and the City recently celebrated the groundbreaking of the next phase in the Centennial Corridor project, a $630 million freeway extension through the City’s Westpark neighborhood. 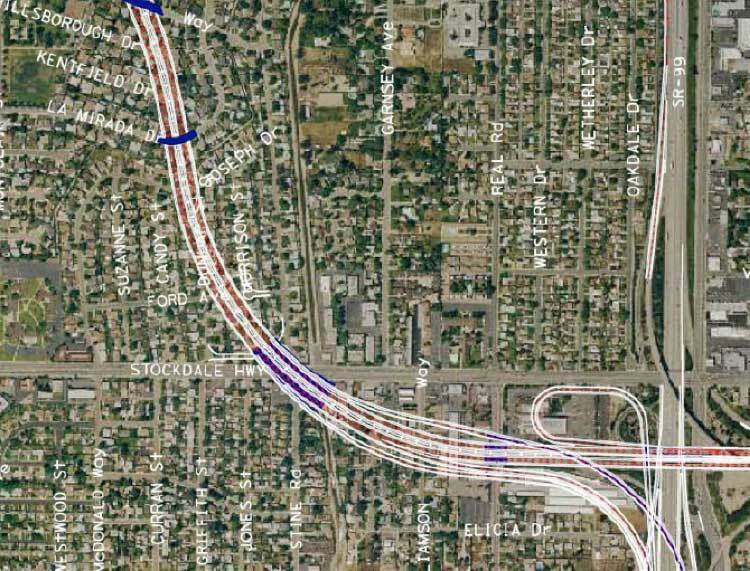 We covered the project three years ago, which plans to connect the Westside Parkway and Highway 58. A future phase of the project would connect Bakersfield to I-5, though this phase lacks funding. Recent photos and videos of the bulldozer’s devastating gash through Westpark underscores the human toll of the project. Over 200 single family homes, 15 multifamily residential buildings, and 36 commercial structures will be destroyed, displacing nearly 1,000 residents. About 60 percent of residents in the Westpark neighborhood are people of color, many of whom have lived in the neighborhood for decades. Those who avoided demolition have also been affected: gutting the neighborhood has produced a major crime wave. After the freeway’s completion in about five years, neighbors will be adversely affected by noise and air pollution in what is already one of the country’s most polluted cities. Left: the Cadena family’s home was bulldozed by the Centennial Corridor project, while Victor Crofton’s home across the street was spared. The Centennial Corridor illustrates the juxtaposition between California’s policies supporting sustainable land use and transportation planning and actions supporting the status quo. The Centennial Corridor may be among the most environmentally destructive, sprawl-inducing, wasteful highway boondoggles in the state, but it’s not the only one: regions from Stanislaus County to Santa Cruz are pushing costly freeway expansions inconsistent with reducing vehicle miles traveled and greenhouse gas emissions. Ironically, as leaders like Bakersfield’s Kevin McCarthy support destructive and costly boondoggles with uncertain financial futures, they have fought more sustainable projects like California High Speed Rail over property impacts and fiscal austerity. There is a broad consensus that California’s transportation infrastructure is in shambles; we must both rebuild what we have and prepare for a more sustainable future. The Centennial Corridor achieves neither of these goals: it recklessly spends limited resources on a backwards vision that has brought social, economic, and environmental calamity to Kern County. If Bakersfield and the rest of California are to achieve a better future, we must demand better from Caltrans and our local decision makers.